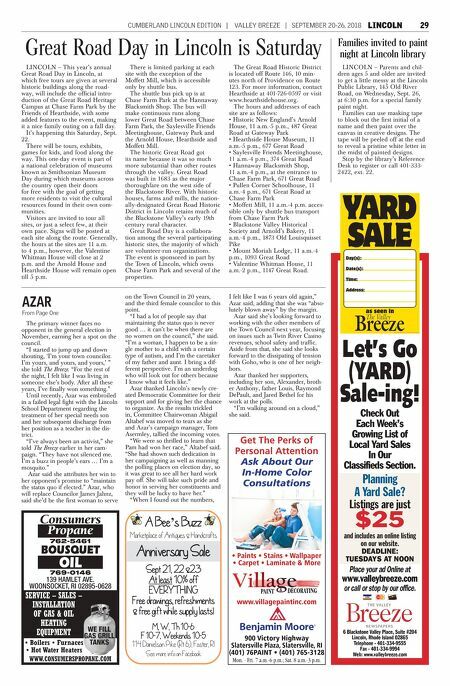 CUMBERLAND LINCOLN EDITION | VALLEY BREEZE | SEPTEMBER 20-26, 2018 LINCOLN 29 The primary winner faces no opponent in the general election in November, earning her a spot on the council. "I started to jump up and down shouting, 'I'm your town councilor. I'm yours, and yours, and yours,' " she told The Breeze. "For the rest of the night, I felt like I was living in someone else's body. After all these years, I've finally won something." Until recently, Azar was embroiled in a failed legal fight with the Lincoln School Department regarding the treatment of her special needs son and her subsequent discharge from her position as a teacher in the dis- trict. "I've always been an activist," she told The Breeze earlier in her cam- paign. "They have not silenced me. I'm a buzz in people's ears … I'm a mosquito." Azar said she attributes her win to her opponent's promise to "maintain the status quo if elected." Azar, who will replace Councilor James Jahnz, said she'd be the first woman to serve on the Town Council in 20 years, and the third female councilor to this point. "I had a lot of people say that maintaining the status quo is never good … it can't be when there are no women on the council," she said. "I'm a woman, I happen to be a sin- gle mother to a child with a certain type of autism, and I'm the caretaker of my father and aunt. I bring a dif- ferent perspective. I'm an underdog who will look out for others because I know what it feels like." Azar thanked Lincoln's newly cre- ated Democratic Committee for their support and for giving her the chance to organize. As the results trickled in, Committee Chairwoman Abigail Altabef was moved to tears as she and Azar's campaign manager, Tom Asermley, tallied the incoming votes. "We were so thrilled to learn that Pam had won her race," Altabef said. 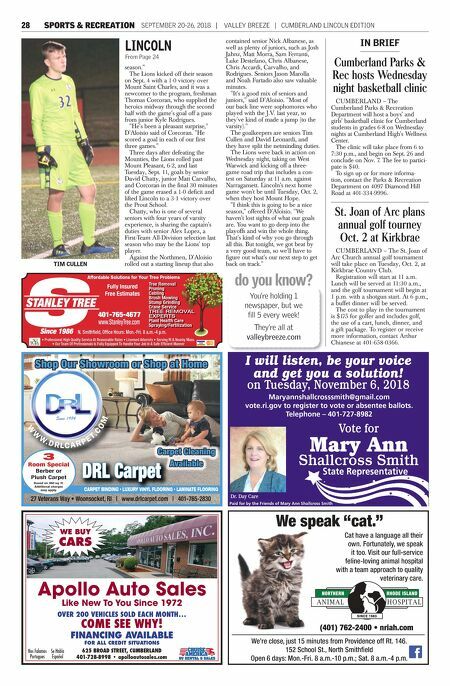 "She had shown such dedication in her campaigning as well as manning the polling places on election day, so it was great to see all her hard work pay off. She will take such pride and honor in serving her constituents and they will be lucky to have her." "When I found out the numbers, I felt like I was 6 years old again," Azar said, adding that she was "abso- lutely blown away" by the margin. Azar said she's looking forward to working with the other members of the Town Council next year, focusing on issues such as Twin River Casino revenues, school safety and traffic. Aside from that, she said she looks forward to the dissipating of tension with Goho, who is one of her neigh- bors. Azar thanked her supporters, including her son, Alexander, broth- er Anthony, father Louis, Raymond DePault, and Jared Bethel for his work at the polls. "I'm walking around on a cloud," she said. AZAR From Page One Great Road Day in Lincoln is Saturday LINCOLN – This year's annual Great Road Day in Lincoln, at which free tours are given at several historic buildings along the road- way, will include the official intro- duction of the Great Road Heritage Campus at Chase Farm Park by the Friends of Hearthside, with some added features to the event, making it a nice family outing on a fall day. It's happening this Saturday, Sept. 22. There will be tours, exhibits, games for kids, and food along the way. This one-day event is part of a national celebration of museums known as Smithsonian Museum Day during which museums across the country open their doors for free with the goal of getting more residents to visit the cultural resources found in their own com- munities. Visitors are invited to tour all sites, or just a select few, at their own pace. Signs will be posted at each site along the route. Generally, the hours at the sites are 11 a.m. to 4 p.m., however, the Valentine Whitman House will close at 2 p.m. and the Arnold House and Hearthside House will remain open till 5 p.m. There is limited parking at each site with the exception of the Moffett Mill, which is accessible only by shuttle bus. The shuttle bus pick up is at Chase Farm Park at the Hannaway Blacksmith Shop. The bus will make continuous runs along lower Great Road between Chase Farm Park, the Saylesville Friends Meetinghouse, Gateway Park and the Arnold House, Hearthside and Moffett Mill. The historic Great Road got its name because it was so much more substantial than other routes through the valley. Great Road was built in 1683 as the major thoroughfare on the west side of the Blackstone River. With historic houses, farms and mills, the nation- ally-designated Great Road Historic District in Lincoln retains much of the Blackstone Valley's early 19th century rural character. Great Road Day is a collabora- tion among the several participating historic sites, the majority of which are volunteer-run organizations. The event is sponsored in part by the Town of Lincoln, which owns Chase Farm Park and several of the properties. The Great Road Historic District is located off Route 146, 10 min- utes north of Providence on Route 123. For more information, contact Hearthside at 401-726-0597 or visit www.hearthsidehouse.org. The hours and addresses of each site are as follows: • Historic New England's Arnold House, 11 a.m.-5 p.m., 487 Great Road at Gateway Park • Hearthside House Museum, 11 a.m.-5 p.m., 677 Great Road • Saylesville Friends Meetinghouse, 11 a.m.-4 p.m., 374 Great Road • Hannaway Blacksmith Shop, 11 a.m.-4 p.m., at the entrance to Chase Farm Park, 671 Great Road • Pullen Corner Schoolhouse, 11 a.m.-4 p.m., 671 Great Road at Chase Farm Park • Moffett Mill, 11 a.m.-4 p.m. acces- sible only by shuttle bus transport from Chase Farm Park • Blackstone Valley Historical Society and Arnold's Bakery, 11 a.m.-4 p.m., 1873 Old Louisquisset Pike • Mount Moriah Lodge, 11 a.m.-4 p.m., 1093 Great Road • Valentine Whitman House, 11 a.m.-2 p.m., 1147 Great Road. Families invited to paint night at Lincoln library LINCOLN – Parents and chil- dren ages 5 and older are invited to get a little messy at the Lincoln Public Library, 145 Old River Road, on Wednesday, Sept. 26, at 6:30 p.m. for a special family paint night. Families can use masking tape to block out the first initial of a name and then paint over the canvas in creative designs. The tape will be peeled off at the end to reveal a pristine white letter in the midst of painted designs. Stop by the library's Reference Desk to register or call 401-333- 2422, ext. 22. 6 Blackstone Valley Place, Suite #204 Lincoln, Rhode Island 02865 Telephone - 401-334-9555 Fax - 401-334-9994 Web: www.valleybreeze.com Check Out Each Week's Growing List of Local Yard Sales In Our Classifieds Section. Planning A Yard Sale? Listings are just $25 and includes an online listing on our website. DEADLINE: TUESDAYS AT NOON Place your ad Online at www.valleybreeze.com or call or stop by our office. Let's Go (YARD) Sale-ing! YARD SALE as seen in Day(s): Date(s): Tim e: Address: Please dispose of this sign as soon as your Yard Sale ends. Thank you! Consumers Propane 762-5461 BOUSQUET OIL 769-0146 139 HAMLET AVE. WOONSOCKET, RI 02895-0628 SERVICE – SALES – INSTALLATION OF GAS & OIL HEATING EQUIPMENT s "OILERS s &URNACES s (OT 7ATER (EATERS 777#/.35-%2302/0!.%#/- WE FILL GAS GRILL TANKS Get The Perks of Personal Attention Ask About Our In-Home Color Consultations s 0AINTS s 3TAINS s 7ALLPAPER s #ARPET s ,AMINATE -ORE WWWVILLAGEPAINTINCCOM PAINT DECORATING & 6ICTORY (IGHWAY 3LATERSVILLE 0LAZA 3LATERSVILLE 2) 0! ).4 s Mon. - Fri. 7 a.m.-6 p.m.; Sat. 8 a.m.-3 p.m.